Choose which door(s) you need. The listing comes up for all four doors which is our recommendation. You can add or delete doors by checking/unchecking boxes. One door - $115, Two doors - $155, Three doors - $195, Four doors - $235, Five doors - $275. The HeaterTreater attacks the root cause of the failure by constructing steel hardware that is designed to last for the life of the automobile, no plastic that could ever break again. The kit includes detailed instructions and all hardware required to complete the fix, including dremel bits and metal tape to seal the cut. As opposed to other kits ours does NOT require dashboard removal. The doors are complete with sealing foam on the doors and connection out to the actuator motor to insure full functionality. Note that the actuator motors on these models are very robust and we don't recommend replacing motors like the Fords or Chevys. The Dodge Ram Pick up Truck has four doors that can all fail independently of each other. The lower blend door is a follower to the upper blend door and really can't fail if the upper door is intact. Due to poor design, the failure of each door is inevitable and we recommend you replace all of them rather than having to do the same fix multiple times. Heater Treater offers special discounts for purchasing more than one repair kit at a time. The available options for this product are shown at the bottom of this page. The HeaterTreater replaces any of the plastic doors in the Dodge Ram HVAC system with steel. Replacing the existing doors with another plastic door is at best a stop-gap solution. The failure is a result of excessive forces generated by the DC servo motor in the calibration of the door. If you are considering aluminum or plastic doors, please read the comments below. There are five different door systems in the truck and HeaterTreater can replace any or all of the doors. This door is located above the fan motor behind the glove box opening. You can observe the door by fully opening the glove box and checking the door through the internal air intake grate. When broken, it can either stall in one position or fall down on top of the fan motor. It should be either fully open or fully closed, never in the middle. The RAM has a design flaw and a stop point molded into the re-circ box is missing such that force is always applied to the door in one direction, not the limit pin as designed. This door is most susceptible to failure and replacing it with plastic will ultimately fail again. The dealer sells a complete new box with the molding error fixed, but you have to remove the plenum box and evacuate the AC to access it. Even after all the work and with re-designed parts, the cheap plastic will still fail again. Our steel door takes into account the Dodge design error and is a permanent fix. The truck has an upper and lower blend door that "clamshell" over the heater core which is on a horizontal plane. The upper door is connected to the actuator motor and has to withstand the calibration forces and is susceptible to breakage. The lower door is connected to the upper door with a wire rod and is strictly a follower to the upper door. Typically we see the upper door break and recommend replacing just the upper door and just re-use the lower plastic door since it is primarily flow control, not temperature, and it is more difficult to replace. We can replace the lower door if there is physical damage to the lower door, just contact us via email (support@heatertreater.net) and we will provide parts and additional instructions. The lower blend door is sometimes referred to as the “fifth door” and generally replacing it is not necessary. The above discussion is for single control, not dual control(separate temperature control for driver and passenger). On the dual control system there is an actuator motor hidden on the back of the box to control the passenger side blend doors. We can replace the upper and lower doors, but this will convert the system from dual control to single control. Note that failure on the dual control system is rare and generally we recommend leaving it alone unless there is obvious physical damage. May be a different control algorithm or stronger parts, but failure is rare. There are two mode doors that control the direction of air flow. The mode 1 door cuts the dash vents on and off, and when off air is diverted down to the mode 2 door which switches between floor and defrost. The most common symptom of a bad mode 1 door is for the truck to be stuck on dash air with no floor or defrost. This is a safety issue if you encounter ice or snow and should be fixed. The video linked below shows this door being replaced. This door will switch between floor and defrost when the dash vents are off. The most common failure is to be stuck on defrost with no floor. In some areas of the country this may not be a big problem but we get complaints from guys pushing snow plows in Minnesota that can't live with cold feet!!! We recommend replacing both mode doors if either is broken. On the four door mega-cab there may be an additional door connected to the mode 2 door that controls the amount of air flow to the back seat. It's kind of a goofy design and will cut off air to the back seat when in max defrost mode. That would be useful if climbing Mt. Everest in a blizzard but just cutting up the fan flow will generally suffice. The back seat flow is poorly designed and always breaks. The dealer solution is to replace the entire lower box, but this is at best a temporary fix. We replace the mode 2 door and just block the rear seat vent about 1/4 open or any position up to blocking rear air dependent on usage of the truck. This is how trucks were configured for years and the added functionality is problematic on the later trucks, and its best to just eliminate it. We are the industry engineering experts on air doors and have been in business over ten years with multiple vehicle application. Early on we evaluated aluminum doors and found some obvious and not so obvious issues. We generally don’t address competition negative advertising, but have been attacked via videos and product listings and would prefer to get reliable scientific information to counteract un-informed comments. Our “aluminum” competitors originally advertised a light weight blend door that was “less stressful” on the actuator motors. Comments below address that issue and the aluminum weld process, and our engineering comments provided the intelligence for them to make modifications. We don’t like doing the engineering analysis for other companies, but you can’t control theft… and comments below will probably extend the process. We can’t be completely positive, but the doors they manufacture look to be 3D printing using aluminum powder which is melted with a laser. This process will always look good, but is not in use for components that require structural integrity, mainly art and prototypes. The aluminum guys give you the option of replacing the motor connector or re-using the OEM plastic piece. The plastic is not designed to withstand the forces of the calibration process and the little hollow plastic shafts break quickly. It shows a misunderstanding of the process and forces involved and is offering a customer solution that is destined for failure. In case you are aware enough to not use the plastic and buy their aluminum connectors, there are additional problems. Aluminum is not strong enough to withstand the torque of the actuator motors. The calibration process drives the highly geared DC motor to a stall point and then reverses to find the other extent of movement. This is an automatic process governed by frequency of starting the engine and cannot be avoided. Using an aluminum interface is the equivalent of buying an aluminum screw driver…it looks good, but won’t stand up to the forces. As the malleable aluminum deforms, the calibration process is compromised and the computer can’t correctly position and control the doors. Our steel construction does not deform and will retain reliable operation for the life of the vehicle. In their video they promote their use of more industry standard “OEM” foam sealant on the doors. Really just porous foam like packing material. The RAM doesn’t have a cabin filter and you can get dust and organic material into the system which will lodge in the open foam. Check your old doors when you remove them and you’ll see that the material flakes and is a disgusting mess. We use a dense Polyurethane foam that is moisture resistant and does not have cavities to trap particulates. It gives a clean long lasting performance There is also a claim that the cheap form is more compliant and that is true, but with the extreme forces from the motor on the doors, the polyurethane will form to the sealing surfaces and provide superior sealing to a more compliant packing foam. Using OEM sealing foam is NOT a good idea. In short, we have been in this business over ten years and are an engineering firm that fully understands the dynamics of the system. Our steel doors are designed to last longer than the truck and we have a long track history of success with the product. The aluminum doors do look better, but with a door buried in the plenum box, beauty doesn’t count, just functionality, and our doors are superior to the aluminum scam doors. - Aluminum would appear to be lighter and less stressful on the actuator motor...not true. As we all learned in Kindergarten physics, if you have a fat guy sitting in the center of the see-saw, it doesn't have an impact. Rotational stress is a function of distance from the axis. Our doors are heavier, but the bulk of the weight is in the axle which has no impact on required torque. In fact, the added axle weight actually stabilizes movement. - The actuator motors have waaaay more torque capacity than required for this application, and actually is the root cause of the common failures. We've been doing this across multiple models and have never seen an issue with motors wearing out or breaking with steel doors. - Welding aluminum plate is problematic and we saw issues early on with doors breaking at the periphery of the weld pattern. Aluminum plate changes physical characteristics from the extreme heat associated with welding and becomes weaker at the weld point. This is why aluminum plate is riveted, not welded on airplanes. Welding is OK on aluminum structural components that can withstand the heat, but not plate. - Our steel plate is more rigid and gives a more reliable and consistent seal against the extents of movement. We’ve seen comments that my plastic door lasted 10yrs or more and I”ll just replace it with another plastic door and get 10 more years of service. On the surface that sounds logical, but it’s not quite true. The failure is due to the weakness of the plastic door and the torque applied by the actuator motor during the calibration process which is an automatic function that can’t be controlled. The original battery in the vehicle was the minimum that the supplier could provide and lowest cost. You never see a Ford advertisement that says “buy our vehicle because we use better batteries than Chevy”. However, aftermarket battery sales companies want to provide a battery that will last longer and perform better since they have to stand behind their product. It’s common to go from a 55CCA OEM battery to a 70CCA replacement. You’ll notice brighter headlights, quicker starting, more start power on those cold days, and power windows that go up/down faster. This impact also shows up on the torque applied during the HVAC calibration process and will break a new plastic door much faster than the original door. The calibration is a function of on/off cycles of the engine and depending on usage, expect a replacement door to last only 12-18 months. Even a metal connection on the replacement air door to the motor will fail because the plastic stop points on the box will break, transferring force to the plastic door again. Our metal doors replace all the plastic components with steel and the doors are strong enough to withstand any forces that the system applies and will be a permanent fix to the system. If you are selling the vehicle and just want it to work long enough to get rid of it, cheap plastic is a viable solution. If you need longer term performance, steel doors are the way to go!! The standard Dodge dealer fix for the door failure is to remove the plenum box and replace the plenum box. Removal of the box requires removing the dash panel, removing steering wheel and steering column, evacuating and disconnecting the AC compressor, draining and disconnecting the heater hoses. Fixing the door is relatively easy, but the labor(and cost) of getting to the door makes this a time consuming and expensive job. The Heater Treater avoids the hard work by providing a kit that allows the repair to be done with superior components without having to disassemble the automobile. 1-2 hours work vs 8-14 hours of work, and no specialized mechanical skills or tools required. The 2002 Ram was a changeover year. If you have an ’02 you should check this listing and the ’95-’02 listing to see which system you have. The Dodge Ram Pick up Truck has four separate doors that can all fail independently of each other. Due to poor design, the failure of each door is inevitable and we recommend you replace all of them rather than having to do the same fix multiple times. 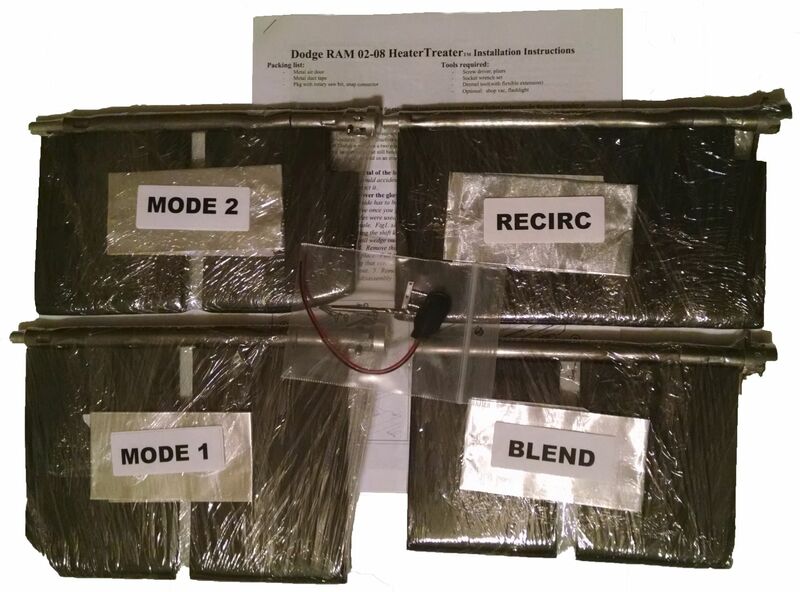 Heater Treater offers special discounts for purchasing more than one repair kit at a time. We sell the first door at $119.92 which covers overhead and margin and additional doors at $45ea. The following videos take you through the process of diagnosing which doors are broken and how to fix them. Once you have the Heater Treater system, repairing the doors takes less than an hour and can be done by anyone regardless of mechanical experience.